Beloved internet comic XKCD is back with its fourth satirical smartphone design. The XKCD Phone 4 is a beautiful hot mess packed to the brim with ridiculous features, and it also manages to take a shot at Apple’s rumored iPhone 7. Apple is widely expected to ship the iPhone 7 without a headphone jack, forcing customers to use wireless Bluetooth headphones or plug into the Lightning port. So XKCD takes opposite route, packing its design with a whopping 12 headphones ports. We guess that means 12 people could listen at once on with their own headphones? 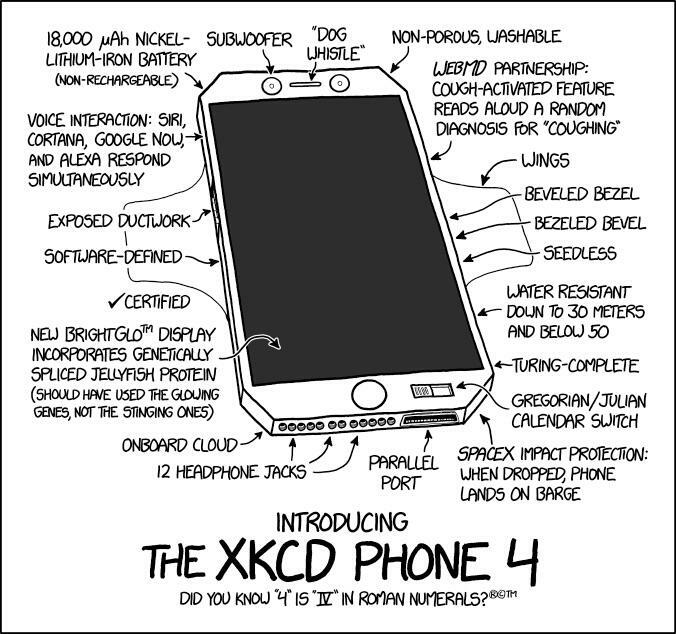 We wouldn’t try to make too much sense of anything included in the XKCD Phone 4. It also features a “parallel port” and a physical switch for jumping between the Gregorian and Julian calendar. It even offers special SpaceX protection so if you drop it the device will automatically guide itself into a safe landing on top of a floating barge. There’s plenty more where that came from, so take a good look at the cartoon above. My favorite feature may just be the new voice interaction, which has Siri, Cortana, Google Now and Alexa all responding simultaneously to your commands. If you missed the last three models from XKCD you can also check those out to via the source links below.